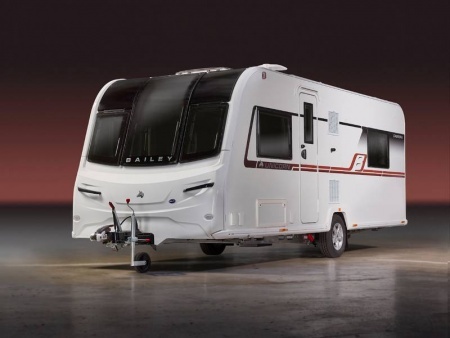 The single axle, 4 berth, Bailey Unicorn Cabrera shares the same overall length with the Valencia, the Vigo and the Cadiz. Both the Cabrera and the Vigo have double island beds but the position of the washroom in each caravan is a major difference. All four models have very similar, though not identical front lounge and kitchen layouts. Because the washroom is positioned centrally in the caravan, it can be accessed without having to go through the bedroom. This is particularly useful at night. Anyone sleeping in the front lounge area can still go to the washroom without disturbing others in the bedroom. Seating - each seat measures 1.72 metres in length before cushions are put in place, giving ample seating for a four berth caravan. The seats have angled backrests and there are seat ventilation boards to enhanced the heating efficiency. Night-Time Lighting - there are 4 directional spotlights, each with their own switch. This means that you can select which ones to have on or off. The two lights at the very front of the lounge also have USB sockets which can be used to charge your USB device ( see photgraphs ). In addition to these there are also two fixed spotlights in the ceiling near the rooflight. Daylight - daylight into the front lounge is provided by a combination of the surrounding windows, the large front vertical panoramic skylight window and the rooflight above. Storage - The storage space beneath the seats can be accessed by removing the seat cushions and lifting the slatted wood frame ( this gives full access ) or via the small doors that are in either the front or side of the seat bases - however the latter only gives partial access. The two large white, gloss fronted overhead cupboards ( one each side ) have soft closing doors and inside are devided into two sections ( see photographs ). In addition to these there are the smaller side opening, white fronted cupboards in the corners. One of these houses the CD player. Finally, there is the the two drawer cabinet between the seats. This also has a handy occasional table that pulls out and pushes back easily. Using As A Sleeping Area - The front lounge has Bailey's Easy Bed Make-Up System. This is an array of wooden slats that pulls out from under the two drawer cabinet on a glide-track. It makes the process of changing the lounge into a sleeping area easier and less tiresome. To cut out light, all rooflights and windows have integral pleated blinds. You can either make the area into a double bed; 6' 6" x 4' 2" or two singles; 5' 7" x 2' 3"
Storage - Below the worktop and to the left of the kitchen are what look like, three large drawers with white fronts. Infact, the top two are deep drawers and the bottom section is a bottom hinged door. The large white, gloss fronted overhead cupboard has a soft closing door and inside is devided into left and right sections. To the right of the cooker is a tall thin cupboard and there is also a useful one beneath the cooker ideal for storing baking trays etc. Above the fridge on the opposite side of the caravan is another good sized storage cupboard. Worktop - Bailey have fitted a worktop extension flap to provide more worktop space when needed; typically when preparing meals. In addition to this there is a hinged cover that comes down over the hob area. This matches the worktop and fits flush with it. Daylight - the wide window behind the sink gives daylight onto the worktop and is fitted with a Remi splash proof blind. There is also a rooflight above giving natural daylight into the kitchen area. Hob - Thetford dual fuel hob with electric hotplate and 3 gas burners. Refrigerator - Dometic 134 litre tower refrigerator with electronic ignition. Note: the fridge is situated on the opposite side of the caravan. Microwave - Daewoo stainless steel 800 watt microwave oven positioned above the hob. Sink - a stainless steel kitchen sink is inset into the worktop. There is a swan neck mixer tap to supply hot and cold water. A washing-up bowl, drainer and chopping board are also supplied. The central washroom means it can be accessed from both the front lounge and the rear bedroom of the caravan. This means that is no longer necessary to go through the bedroom to get to the washroom facilities. Shower Cubicle - the shower cubicle is fully lined and measures 70cm x 78cm. It is finished in a very smart, modern and practical grey coloured lining. There is a fixed light inside the shower cubicle. The shower is fitted with the popular EcoCamel shower head. The cubicle has a bi-fold door to seperate it from the rest of the washroom and there is a roof vent to reduce condensation. Toilet - The Bailey Unicorn Cabrera has a Thetford C-260 cassette toilet with remote header tank. WashBasin - the washbasin has a single mixer tap for hot and cold water. Behind it is a wall mounted mirror and beneath is a cupboard with a linen basket inside. Small shelves are provided for toiletries. The double island bedroom is at the rear of the caravan and has a highly symetrical feel to it ( see photographs ). The arrangement of windows, lights, side cupboards and overhead lockers are all mirrored in layout. Night-Time Lighting - there are 2 directional spotlights, one for each side of the bed. Each have their own switch and a handy USB connection that can be used to power or charge your mobile phones, tablets and other USB devices. Daylight - there is a good width window on both sides of the bedroom and balancing this light out is a rooflight above. Storage - The storage space beneath the bed is accessed by removing the mattress and lifting the slatted wood frame. There are 6 cupboards in total - 3 each side of the bed. Opening Vertical Skylight - A distinctive feature of the Bailey Unicorn Series, the vertical front skylight provides lots of daylight into the front lounge area. It can be opened to provide ventilation and has an integral two part pleated flyscreen and a night blind as well. AL-KO Chasis - The Unicorn Cabrera has an AL-KO one piece galvanised steel chasis, braking system and running gear. Alu-Tech Bodyshell - supplied with a 6 year transferable bodyshell integrity warranty and a 3 year transferable manufacturers components warranty, the Alu-Tech bodyshell is a patented aluminium external framework that clamps the bodyshell panels together. As a result there are fewer external joints making the shell more weatherproof. Thicker panels provide significantly better insulation keeping you warm in the cold and cooler in the summer. Tracker System - A NEW Tracker Thatcham Cat 7 approved Stolen Vehicle Recovery System ( including the first 3 months subscription fee ). 14 inch Alloy Wheels - NEW design 14 inch TUV tested alloy wheels. ALDE Radiator Heating and Water Heating System - The Alde Hydronic Compact 3020 programmable radiator heating system with combined water heating and washroom panel radiator. The Cabrera is also fitted with an Alde 3020 boiler providing improved fuel economy. Branded DAB Radio / CD / MP3 Player - with USB connection point & bluetooth capability. Connected to dual cone stereo speakers for superior sound quality. Shower Cubicle - fully lined rectangular shower cubicle with bi-folding door, storage shelf and fitted with the very popular energy saving EcoCamel shower head. Signal Reception - Fitted with Vision Plus Status 570 telescopic directional digital television aerial. USB Sockets - the quantity is model specific - but the Unicorn Series 4 caravans are fitted with upto eight USB sockets. Oven & Grill - Fitted with a Thetford Caprice combined oven, grill and hob with electronic ignition and flame failure device. Hob - Fitted with a Thetford dual fuel hob with electronic hotplate and 3 gas burners. Microwave - Fitted with a stainless steel 800 watt microwave oven. MRO: 1377 kg (27.1 cwt) Bed Size - Front Double: 6' 6" x 4' 2"
Bed Size - Front N/S Single: 5' 7" x 2' 3"
Bed Size - Front O/S Single: 5' 7" x 2' 3"
Bed Size - Rear Fixed Double: 6' 1" x 4' 7"